No blog is complete without a blogroll (links to other blogs/sites). My friend Karan Misra decided to make his blogroll a bit more interesting on his (excellent) blog by arranging the links in the order by which they were last updated. I dug the idea and decided to implement it on my blog as well. Halfway through I realised a lot of people may like to do the same with their blogrolls so I created LinkedList.js, and life was good. However, a few of my WordPress using mates kept telling me that life would be even better if I made LinkedList into a WordPress plugin, and so I did! LinkedList.wp is a simple WordPress plugin for sorting your blogroll in the order by which the sites on the blogroll were last updated. LinkedList.wp uses LinkedList.js to achieve the whole sorting thing and is essentially a wrapper, providing an easier way to add LinkedList to WordPress blogs. Imagine, if you will that this is a WordPress blog. This is how the blogroll (presently links to few sites that I frequent) would be sorted. You can check out LinkedList at work on an actual WordPress blog — xAbhishek.com. So you’ve decided to install it on your blog, good! LinkedList uses Google’s excellent AJAX Feed API to read the RSS/Atom feeds, meaning you’ll need a valid Google AJAX Feed API Key for the website where you wish to display the links. Sign up for one if you haven’t got it already (don’t worry there aren’t any forms to fill). Next, download the LinkedList.wp plugin. Unzip the plugin file and upload the linkedlist folder to your WordPress installation’s plugins directory. The plugins directory can be located inside the wp-content directory. Activate LinkedList from the plugins menu inside your WordPress admin. Once activated, you will see a new submenu under plugins — LinkedList Config. Go ahead, click it. Well fill in your API key, select your preferences and fire her up! Make sure the ‘Links’ widget is on your sidebar and you’re all set. LinkedList is clever enough to fetch the links from your Blogroll and auto–detect their feeds. You can, however, make its work a little easier by manually entering the feed URLs ( Manage > Links > Edit Link > Advanced > RSS Address ). I haven’t actually been asked any of these questions (not yet at any rate) so I’ve taken a guess at questions one might have. Which versions of WordPress is LinkedList compatible with? 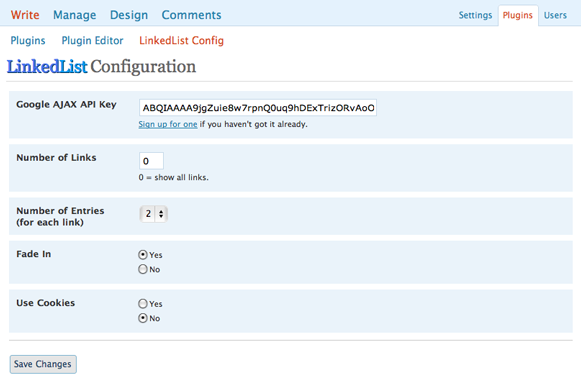 LinkedList works with WordPress versions 2.3 and above. I haven’t tested it with older versions but it’ll probably work just fine. Does LinkedList work with all themes? In an ideal world, it should. If you do bump into a glitch with your theme then drop me a note and I’ll try and fix the issue. What about using LinkedList in themes without widget support? LinkedList.wp is essentially a wrapper around LinkedList.js, so for a more custom implementation, checkout LinkedList.js. Can LinkedList be used on a WordPress.com blog? Like it? Hate it? Want something more out of it? Spotted a bug? General feedback? Drop me an email—I'd love to hear about it! Feeling generous? I like cash feedback just as much (ok, maybe a little more) ;).